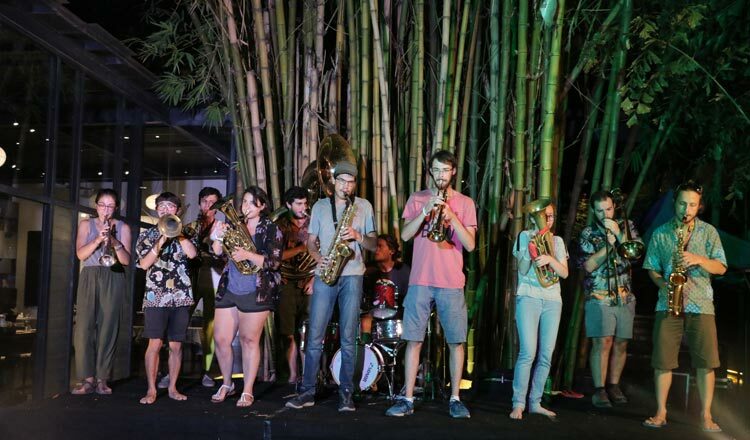 Last Thursday night, Institut Francais du Cambodge transformed itself into a carnival. At the entrance, an artiston stilts was dancing to the sound of tambourines. Another artist, atop a unicycle, confidently moved back and forth, as if dancing to a certain tune. 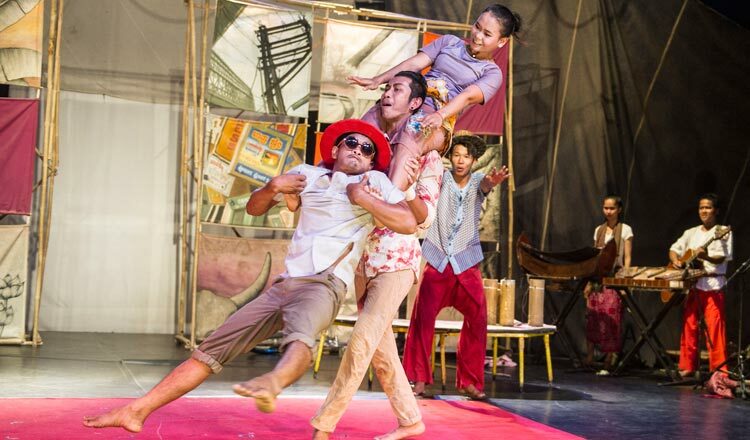 They were a sight not too common in Phnom Penh on ordinary days – enough to encourage people to come in and brace themselves for a night of incredible performances. It was Phare Ponleu Selpak’s 25th anniversary celebration. The art school in Battambang has gained prominence over the years for holding epic art performances and producing creative youths for more than two decades now. The celebration – dubbed “Light the Lights” – was filled with performances and exhibitions that showed why Phare Ponleu Selpak continues to shine bright all through the decades. Phare founders, artists, teachers, graduates and students were all present to mark their triumph. Mr Khuon Det, founder and director of Phare Ponleu Selpak. “Light the Lights is a small reflection of Phare Ponleu Selpak journey. 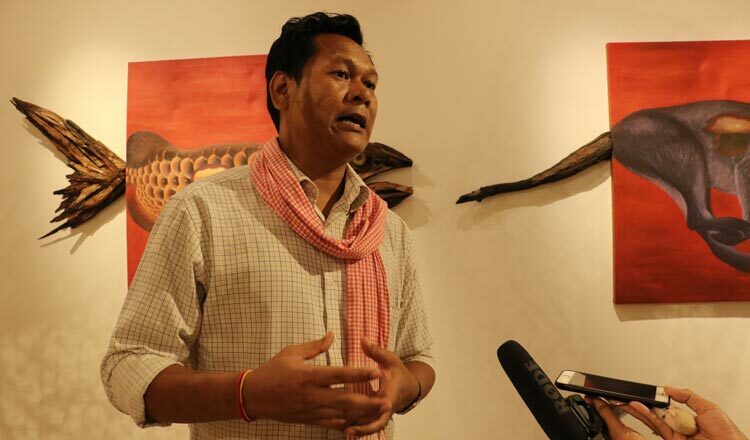 Light the Lights Festival is also a reflection of the renewal of art and art education in Cambodia,” said Osman Khawaja, Executive Director of Phare Ponleu Selpak in his opening remarks at the 25th anniversary celebration. Established in 1994, Phare Ponleu Selpak was formed by group of young people who wanted to promote art education to other young people in Cambodia. According to Mr Osman, the story started in Site Two Refugee Camp along the Thai border, where hundreds of children strived to brighten up their lives through art classes. Nine of those children developed friendship while attending art classes with the French art teacher. They came together after the war as young adults and decided to pass on that light to hundreds of children. They opened up a center in Battambang called Phare Ponleu Selpak. “Those first generation of Phare students have become the teachers who continue to pass the light of the art to thousands of children that attend vocational and professional classes every year,” said Mr. Osman, adding that students of Phare also use arts to raise awareness on social issues such drug addiction, HIV, immigration and so on. Aiming to take its mission higher and wider, Phare Ponleu Selpak now invests USD1 million a year. The funds are used to push for more comprehensible art classes for Cambodian youth. “From under USD3,000 budget a year to over USD1 million a year today, the investment in arts and education, and the future of hundreds of youth has increased by leaps and bounds,” emphasises Mr. Osman. Huge part of the center’s fund come from organisations and individuals in France. Today, over 30 percent of Phare’s institutional funding is from French donors and organisations. Cambodia’s Ministry of Culture and Fine Arts also takes a big role in keeping Phare’s activities alive and consistent. Giving a short speech in the opening ceremony of Phare’s 25th anniversary, Minister Phoeung Sakona, announced that the government has lifted tax from Phare Ponleu Selpak social enterprise to keeps its operations and programmes more efficient. “For 25 years, hundreds of lives of Cambodia children were saved from illiteracy and were able to find opportunities to find jobs and can live with honour,” said the minister, referring to the efforts of Phare in providing education to Cambodians. She added, “We will always try to help Phare. Because when we help Phare, it means that we are helping the future of Cambodian people”. So far, Phare has already produced more than 2,000 graduates and over a thousand of them are using their talents at well-known companies. The center currently has 1,200 students pursuing education – visual arts, animation, graphic design, circus, dancing, music and acting – in Battambang. Aside from art classes, Phare also holds general knowledge classes and social support to children. “I am delighted that so far we have got good results from our students. We will try harder to continue our human resource development journey in the field of arts. We have only several senior artists remaining. And even though we provide education to the new ones, it still not enough, that’s why Phare is trying to work more in order to build more talents in art for the country,” said Mr Khuon Det, founder and director of the performing art school. With the support from the government, ministry, donors and the people in the community, Phare Ponleu Selpak vows to continue working hard to make young people’s future sustainable. The organisation plans to expand to other provinces in the future and help other children unleash their creative skills and help them build better lives.